Our crew, Number 80, had only flown one mission up to that point to Knaben, Norway (Mission 42), and several training flights including the ill-conceived “Grapefruit” bombing trials of 2000-pound flying bombs. When the target was revealed on the map that morning showing our tracking to Bremen, an audible moan went up from the crews. We had heard that Bremen was a tough target because the shipping area was defended by 236, 30-meter tall, concrete flak towers each mounting two 88mm anti-aircraft guns These guns fired 21 rounds a minute from each barrel and the shell fuses were set by machine from radar input. Also, it was revealed that morning that the Germans had installed anti-aircraft guns on all rail cars creating a 20-mile radius of intense flak. Needless to say, the defense of Bremen was quite good with flak, but there were the fighters, too. Our ship was named The Deacon’s Sinners after bombardier 2nd Lt. Melvin D. Henroid, who was the oldest man on the crew. The rest of us being much younger looked up to the “old man” who had a calming influence on us. 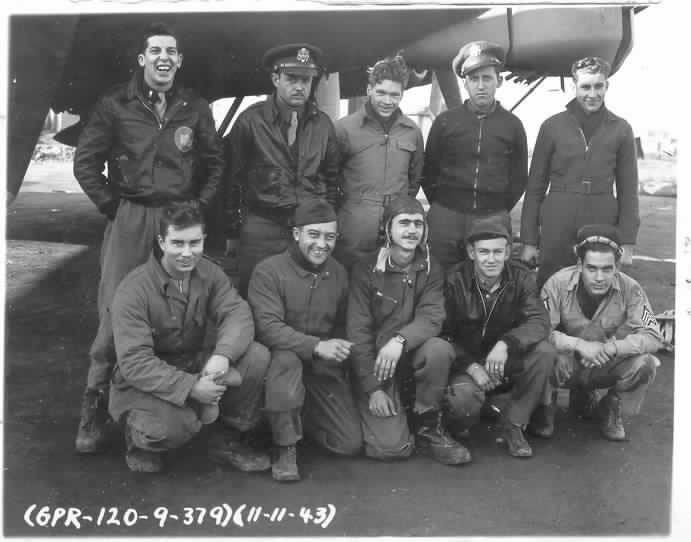 Our crew that day consisted of: Thomas E. Eaton, pilot; Henry L. Hainline, co-pilot; Michael Roskovitch, navigator; Ray T. Matheny, engineer; Arnold G. Clark, radio; Ray Ferrell, ball turret; Arnold E. Nevells, right waist; Boleslaw B. Ceglarek, left waist; and Robert J. Lamoureaux, tail. I believe that our altitude that day was 25,000’ over the target that required several hours of steady climb with our load of 250-lb bombs. We were promised Spitfire cover for a few minutes at sea near the Dutch coast, then a rendezvous with P-47s for 5-10 minutes to assist us from German fighters stationed at Lefuwarden guarding the south coast. The north approach was guarded with fighters at Jever, Nordholz and Oldenburg. There German staffeln could sit on the ground until radar tracking figured out our intentions, then strike the bombers on the way to the target and strike again on the way out, as refueling was nearby. We were told that several new Wurzburg radar antennae were noted on aerial photographs that would give the German fighter command a 150-mile warning of our approach. None of this news of the defense of Bremen cheered us. As I remember, Henroid disliked the 250-lb British fire-type bombs we carried that day. He had some trouble with the fuses because they were in the tail of the bomb instead of the nose and arming wires had to be hooked up differently. And besides, it was reported that sometimes the tail fins came off altering the bomb’s trajectory. The crew talked about the use of these bombs and disliked dropping firebombs on a city where civilian populations lived. We still were new at this war and were filled with ideals of doing battle sol­dier to soldier, attacking military installations, and factories that produced war materials. Intermittent notes from my account of the mission include a flight engineer’s concern about the flight. I later wrote: “The high power climb to 9,000 feet over England was costly in fuel, and assembly of the planes took fuel as well. Being The Deacons Sinners chief worrier, I thought about the fuel requirements of the flight but could do nothing about it. We were burning about 450 gallons of fuel per hour in the climb and just under 400 gph during assembly, now we were back to 430 gph for the long continued climb to Bremen . . . I counted 36 or 37 airplanes in a three-tiered formation where the lead echelon of 12 planes flew above the rear box of the lead formation. We flew in the lower echelon of 12 airplanes and would receive the worst flak. . . . We still were in a slow climb in loose formation when we had been airborne about 3 1/2 hours. We were at 22,000 feet over the north coast of Germany with a huge bay on our right. No one had seen a Spitfire or P-47 since we had taken off and I supposed that the long climb through the overcast, and difficult assembly had cost us this valuable protection. After all, we expected the P-47s for only five minutes or so just inland of the German coast, and we missed them. Power went to full to bring us up to 25,000’ in the next few miles. . . . ‘Bandits at 2 o’clock,’ Nevells called. They were Me-109s, in several schwarmen of four planes each, about 3,000’ above us streaming contrails. Contrails suddenly appeared from behind our engines as the group climbed to colder conditions. Each ship produced its own clouds of condensed ice crystals behind it that grew as the ship climbed. That day at 25,000’ the contrails were heavy, stringy clouds that floated in the rarified air. The new clouds gave me a sense of security; a partial masking of our ship from a three-plane formation above us, but this feeling soon left as I saw Me-109s using the contrails to conceal their presence. The fighter attack continued until Henroid called out a red burst of flak and immediately the fighters drew back, then disappeared. This was the signal from German anti-aircraft gunners to the attacking fighters just outside of Bremen that intensive flak was ahead. True to their signal the flak began with ugly black puffs in front of our group and in a trail the full length of the formation. Flak was classified by flyers according to the danger it posed. The sight of black puffs, even at considerable distance, created a feeling of alarm, the closer to the flak bursts the greater the sense of alarm, which was expressed in ‘pucker factors’ on a scale of 1 to 10. Black puffs of flak 200 feet or more from your airplane always produced a 1 to 2 on the pucker factor scale, but it was rare the bursts at this distance could cause any harm. When the bursts of flak were closer, and a dull red flash could be seen at its center, the factor was over 5, maybe to 7, as there was real danger of shrapnel ripping through your airplane. The factor rose to an 8 or 9 when you not only could see the dull red flash of the exploding shell, but could hear it go off over the roar of the engines and the slip stream noise on the airframe. At this point damage to the airplane was imminent. A pucker factor of 10 was when you were not flying through the black smoke of the exploding shells, but the red flash was bright, the sound deafening, and the force of the explosion lifted your plane up. This latter condition often meant destruction of the airplane and crew within the next few seconds. The flak just about unnerved me. Finally, the lead ship dropped the bombs, and Henroid hit the sequency switch for our bomb release. As the flak continued, Henroid sang to us over the intercom which helped to relieve the tension. The lead ship went on full power to get us out of the line of fire, but the flak continued for such a long time. I heard a ‘crimp,’ ‘crump’ sound telling me the flak was very close. Then our ship was thrown upward and a large hole appeared in the right wing. It looked so strange to see green anti-corrosion painted metal on the under­side of the skin contrasting with the war paint on the surface. There was a sound of more flak bursts and more holes appeared. A green burst of flak appeared, and fighters suddenly resumed their attack. This time I saw a Junkers 88 and two Messerschmitt 210s or 410s, but they flew beside us out of .50 calibre range. Lamoureaux called out that a fighter had lost a wing, probably shot down by a lower echelon gunner. There was a long trail of black smoke in front of our group that must have come from a bomber. Henroid called out two Me-109s at 12 o’clock just a little high I swung the turret around in time to see his guns thumping, too late to get in a shot. Henroid called on the interphone saying in a calm voice that he was hit, and that the navigator was taking care of him. With all that was going on I was not surprised that someone had been wounded, but the news made me cringe. . . . Despite his wound, Henroid seemed to be making it alright, he sat up against the control boxes at his station. The navigator had stopped the bleeding with a large gauze pad and bound his wound. I could offer Henroid no help, and waved to him from the crawl way; he good-spiritedly waved back. We left the German coast, passed the Frisian Islands, dropping down to 20,000 feet, slowly descending over the North Sea. Soon the coast of England came into view and Eaton exclaimed, ‘Thank God the overcast is broken,’ he was beginning to show signs of fatigue, and tore off his helmet handing it to me. . . We approached Kimbolton airfield with a ship in front of us that was firing red flares into the air indicating wounded on board... . I fired a red flare through a Verry pistol mount in the top of the cockpit, then Eaton slipped in behind the other ship. I suppose that everyone was getting nervous at this time as fuel was quite low. What a relief to get down on the ground, and how good it felt to jump out of the ship and feel the earth beneath my feet. This flight had taken six hours. Henroid had been hit in the right knee taking off the patella. The pain was intense, but he carefully took off his helmet and goggles, and put on his army cap before allowing the medics t o carry him out. Our ship had 53 good-sized flak holes in it, mostly in the right wing. Hainline stuck his hand through one hole torn through the wing behind the fuel cell. The right wing had to be replaced keeping our plane on the ground for several days. I traced the path of the bullet that struck Henroid from the nose section through the fuselage. I found the copper jacket of the armor-piercing bullet in the crawl way under the control quadrant of the cockpit. The copper piece had black paint on the tip, and unmistakably, it was a .50 calibre bullet from one of our own planes. I put the copper bullet jacket in my pocket, and did not tell Henroid that he had been wounded by a wild shot from another B-17. Several years after the war, I visited Henroid and his family and finally told him about the .50 calibre bullet.